Wave Will Do For You! You'll learn how to trade with the 'near term trend' from the get go! You'll learn when to trade to secure the most profits to maximize profits. You'll learn exactly where to put your stop loss so you don't get knocked out of the trade prematurely. You'll learn how to sell only when you're supposed to be selling, and you'll learn how to buy only when you're supposed to be buying. That alone will reduce your losses ten fold! 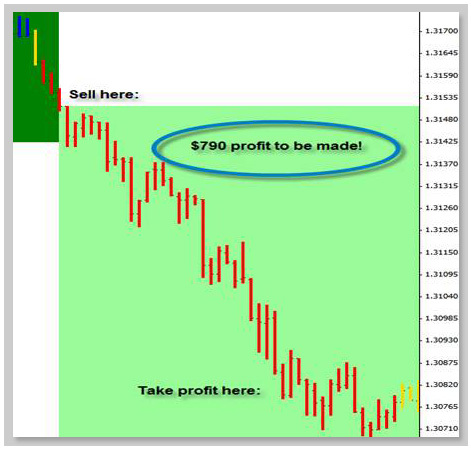 You'll learn how to recognize a profitable trading pattern from a BAD one! You'll learn how to use 'Support & Resistance' in a way to secure more profits. 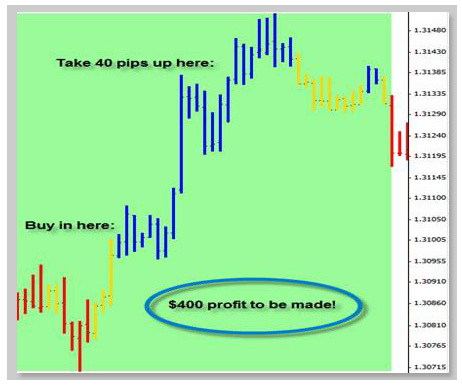 You'll lean how to scalp the Forex Market for a quick 10 to 25 pips and you'll learn how to go for 80 to 100 pips! Starring at your charts all day and night just to get frustrated and lose your shirt. You won't need to use any tools like Fibonacci or Trend Lines, or Crazy Harmonic Butterfly Patterns. You won't have to try and figure out any 'price action setups' like: Pin Bars, Inside Bars, Outside Bars or any other weird bar setups Forex Gurus dreamed up one day when they had drank a few beers. You won't have to try and recognize any so called 'Technical Patterns' like: Head & Shoulders, Triangles, Flags, or any other gibberish! You won't have to draw a bunch of trend lines either. You won't have to put 10 different indicators on your chart to give you a lot of trade indecision either. In fact, Forex Trend Wave is so easy to use because all you have to do is follow the simple color coded sequence to enter a trade. When it's over sold you'll go from red bars to 1 or more yellow bars then to a blue bar...after the first blue bar closes you simply look to buy long... Simple huh? 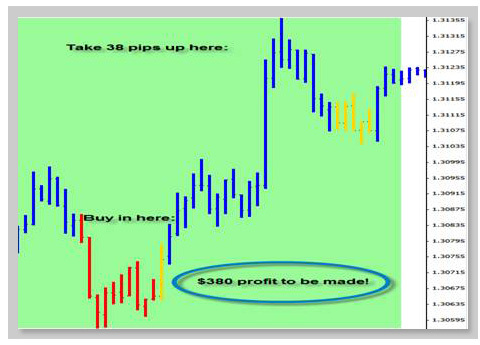 I told you just how simple Forex Trend Wave is to trade! You see the bar close to a Yellow bar. Next you'll see the bar close to a Red bar. Then you sell 1 pip below that Red bar. I'm Not Kidding YOU - It's That Simple!!! Q: If I have a question will I get an answer to my email? A: No, the free version does NOT include anny support! A: Yes it is a very simple process. We assure you of that. Q: Can this be used anywhere in the world? A: Yes, but if you live on a deserted tropical island with no net or electricity then you may have a problem… Other than that 100% YES! Q: Can I use it on a 5 digit broker? A: Yes! And it will work on an ECN as well. Q. Do I need to use Lagging Moving Averages with Forex Trend Wave? A. No, The good thing with Forex Trend Wave is that we don't use lagging Moving Averages and we don't use histograms or useless lagging indicators. Q. Is Forex Trend Wave a Robot? A. No, most robots don't work. Q. Will it work on all currency pairs? A. Yes, it will work on different currency pairs, but the best pairs to trade it on are the 6 majors. Q. What is the learning curve to master Forex Trend Wave? A. You can basically learn it in a few hours! Q. Does the System work on Trade Station or Ninja Trader? A. No, it's for Meta Trader 4 only. Q. What time frames does Forex Trend Wave run on? A. It runs on the 5 minute timeframe.